Who has vested interest here? Perhaps a math-challenged deity auditing a sect of his spawn. Or the CEO of FF Amusement trying to challenge his precocious six year-old. Maybe the sheriff’s office of ‘Town where Family Fun Is.’ Maybe there was a murder at the amusement park and all of the suspects were in this one vehicle and all they had was a receipt that read ‘142.50’ and surveillance cam footage of an overstuffed minivan. It is a stupid problem. It came to me last year to not teach algebraic modeling under the guise of ‘real-life.’ Teach it without pretext. What you and Mathalicious are trying to do is the next phase. Seriously? Do you not get enough mail as it is? Seems to me harder to find stuff that isn’t psuedocontextual than that which is. Um, not that I think it’s not worth calling out, or that it isn’t a problem. I’m hoping your plan with this is to continue to take those psuedo contextual probems,and turn them into real problems. We need more of that. But examples of fake pretending to be legit? I should just mail you my whole textbook. So I’m goofing off on the internet one day come across a rendering of a MacBook concept with a fold-out screen. Turns out that the caption is all sorts of wrong, and one thing leads to another, and at the end of the whole thing I find myself laughing out loud: it’s the first time I’ve ever actually had to *use* a system of equations. It’s a bit more involved than the whole, “In ten years, Bob will be three years older than Fran’s second cousin’s uncle’s fiance (which really bummed Fran’s aunt out, no doubt). How old is Janet” textbook silliness, but orders of magnitude cooler. (It’s actually part of the “Pythagorean TV” lesson, if anyone’s interested: http://www.mathalicious.com/?p=1401. If not, it’s here it is sans lesson: http://www.huffingtonpost.com/2010/08/20/apple-concept-products_n_685412.html#s126525). This is from a medieval Indian text, the “Mahavira.” It’s not hard to pull out more “pseudocontext” examples from just about any early text. Actually, Michael, the dowry problem is a pretty relevant one. A buddy of mine couldn’t answer it, and as a consequence is still single. (Now, when your students ask why they have to know this stuff, you can reply, “You don’t, but you might end up eating Stouffers Singles for the rest of your life”). The pipe problem, though? Nailed it. I think I could send you every word problem in the Saxon Algebra I and Algebra II books I have on my shelf. (I keep them for the nostalgia, mostly.) I’m pretty sure I’ve done every coin combination problem known to mankind. Here’s where my mind always goes in this discussion: every curriculum designer runs into mathematics that “resists” being presented in an authentic, meaningful context. (Example that’s stumped me: rational expressions and equations.) We all know this happens. At what point do we stop contriving a pseudocontext and begin seriously questioning the value of the mathematics? While I don’t want to suggest that we apply mathematical Maoism (http://bit.ly/dnflxz) to the whole of school mathematics, I wonder how well we prepare ourselves to discard pieces of mathematics that we can’t apply in context. As long as these questions are presented without the pretense that anyone will actually ever use this specific skill in real life, I don’t see the problem. I always tell my students that it is highly unlikely that they will need to use the math they are learning in high school in the real world. However it is also unlikely that they will need to use the skills they develop in gym. But the brain needs to be exercised and trained, just the same as the body does. High schoolers don’t learn math because they’ll need to use it, they learn math to train and exercise their brains. If we get rid of the pretense that they will ever actually use the quadratic formula in real life, they will be much less likely to call BS, and much more likely to participate, IMO. I don’t see what’s so deadly about pseudocontext. It can provide examples to illustrate application of a mathematical principle. It creates conditions that are sanitized where simple mathematical models can work. The path of a object thrown in the air isn’t really a parabola in the real world. Just try throwing a hollow plastic ball far and fast. But if you throw it slow enough, the air resistance might not make much of a difference and a parabola is then a good approximation. Or you can also use a heavy enough ball. Reality can be messy. In the real world no one calculates how long it takes a train traveling at 50mph to get somewhere and add it to departure time to find arrival time. I mean no one except the engineer or whoever is in charge of scheduling. Most people just look at the schedule. In the real world, no train travels at 50mph the entire trip. It accelerates and decelerates in the beginning, end, and also when making turns. We assume it travels 50mph the entire time when we give word problems to show how a simple mathematical model involving rates can work. I guess one could argue that for a long trip the acceleration and deceleration is negligible, but if a student is struggling with grasping a new concept, doesn’t exposing them to the imprecision in measurement and sources of error just add to the complexity? Train A heads to City B from City A at 20mph and Train B heads to City A from City B at 10mph on the same track. A bird flies at 30mph between the 2 trains starting by flying from Train A to Train B. If both trains depart at the same time and City A and City B is 60 miles apart, how far will the bird have traveled when the 2 trains meet? First time I did it, I thought about the bird getting squished. Then I actually began calculating the distance traveled when the bird flies from Train A to Train B, then again from Train B to Train A while keeping track of the elapsed time. Then I realized this process would take forever and had to discover another way to calculate the distance. There’s a nice mathematical principle to be discovered here by shifting perspective (calculus or summation are not needed). It’s a problem with pseudocontext. I mean should we take the size of the bird into account? Where would math puzzles fall? I’m not arguing that pseudocontext doesn’t disconnect some kids from math. I can see how kids can be more engaged in math if they did analysis of a real world situation and used mathematical models to come up with results. I can see how problems where they get to apply their knowledge and experience with math can be useful. I can see how that experience can be more authentic and meaningful. Pseudocontext can be a bit of a turn off for some kids, but I’m not seeing why pseudocontext is so bad. Maybe you can enlighten me. PS. In stats, answers to some questions aren’t in the chapter (e.g. What’s the shape of the distribution of height at a little league game?) and often times require student knowledge and experience. The opposite happens there. Some kids don’t know enough. It’s like they were locked in a closet. I find my numeracy students (adults who failed at maths at school) are able to work with these different ideas very well. They accept that having a REAL question in an exam would make the exam take too long and couldn’t be standardised anyway. They are also able to talk to their own kids about all of the above, which I think is a good thing. Jo Boaler’s latest book The elephant in the classroom is equally inspiring. I read it in two sittings. i like that Carolann. very honest. very now-ish. so while we’re here… let’s play some offense and just do… rather spending so much time on defense. i like this Dan… reminds me of Rheingold’s long long list of links to crap, in his crap detection collection. can’t wait till we can detox ourselves back into the first world above and those inherently passionate math and not just in need of mathematical thinking – can swim in the abstracts in bliss. Raymond made a great point earlier about how some content simply resists being taught in a contextual way. As someone who spends a lot if time writing lessons, I look at something like simplifying (4x^6y)/(8xy^3) and have no idea what to do with that. Still, insofar as states test it, I can’t ignore it. Ultimately, though, many of the issues come out in the wash. For if you try to incorporate real-world applications into classroom instruction, then invariably you’ll end up doing more with functions, ratios & proportions, etc., and a lot less with simplifying square roots. The problem comes when teachers don’t distinguish–treat everything as equally (perhaps infinitely) important–which makes it hard to get but-in from kids who know what’s up. Still, if you try to keep it real when possible, then you’ll probably have some cred when you’ve got to hit the relatively trivial. Finally, as many have already mentioned, there I something to be said for learning something, even though you might not have an application in mind (or know if one even exists). Again, I JUST had my first encounter with a system of equations in the real world, so good thing someone taught it to me. Also, there are a few ways of defining math which also informs how we communicate it. You can take something like the normal distribution and focus on shoe sizes, ages, etc. All good. But you can also use it as a way to better understand the way nature may work. You’ve got a kid who grows up and feels in his gut that he wants to be a painter, but the world tells him that he’s crazy. But then maybe he thinks back and says to himself, “But maybe progress and beauty and genius all happen +2 standard deviations from the mean,” and that’s what turns him into Van Gogh. Math becomes something transcendental; it becomes permission. @Michael P (et. al.) Let us not confuse puzzles with pseudocontext. Einstein used thought experiments and simple analogies to explain Special and General Relativity since it made the topic more approachable and easily understood. I teach high school Physics, and have spent the first three weeks doing nothing but Algebraic Modeling. My students have found the relationships between pressure and volume, light intensity and distance, mass and period of a spring, factors that effect a pendulum’s period. Now we’re moving on to interpreting position vs. time and velocity vs. time graphs (and the slope and area under the curve relationships). Usually I have the advantage of teaching many of the same students Calculus the following year, and they are at a huge advantage compared to the ones who didn’t take Physics. There is no question of context when you are dealing with physical laws. I know the difficult in trying to coordinate with other teachers, and other subject areas, but I think that Math may need to do a bit more outreach to the rest of the subject areas. I constant complain about the “Reading across the Curriculum” push, asking “When are we going to do “Math across the Curriculum” and “Science across the Curriculum”? Well, maybe we should make that happen. Nobody else has mentioned it, but Underwood Dudley also calls out this particular problem in his excellent recent article What is Mathematics For?, with the more general thesis that the actual methods involved in algebraic problem solving (as opposed to the abstraction skills which are ostensibly cultivated by them) are of no use whatsoever to most people. Sean hit the nail on the head (with a 1.2 kg hammer traveling at a rate of…) from the outset with the amusement park example. In my opinion, this problem meets 0 of the 5 characteristics of a good problem. @Michael re the problem of filling tanks with hoses: While I agree that the “real word application” of using multiple hoses with different flow rates is pushing it, I see this problem differently than the amusement park problem. LOTS of people’s intuition (including my own at one point in time) would confidently say that the answer is 45 minutes. This problem (unlike the amusement park problem) is compelling (in my opinion) because our intuition is wrong. To me, that’s exciting. 2. I got to create the question. 4. Initially, my intuition was that I didn’t have enough information and once again my intuition failed me. @Mark and Mr. H: There are great dangers in using pseudocontext to pose problems. The biggest, in my opinion, is the beliefs that these problems perpetuate that math is only useful for solving “real world” problems. Not only is this not true, but when kids see right through the pseudocontext it confirms their belief that math isn’t really that interesting or important. On a more content related note, pseudocontext can also change what is being taught/assessed. This is bad news if you think you’re teaching/assessing one thing and it turns out you’re teaching/assessing something completely different. Pseudocontext is oftentimes more harmful than helpful to minority students. There’s a classic example of a problem about buses that hold 42 students each and a field trip with 174 students. So how many buses will you need? Using follow up interviews, a researcher found that lots of urban kids answered 4 (where the intended answer was 5), arguing that the extra 6 kids would either squeeze in or stand (perfectly normal on city buses). Deborah Ball (1995) talks about how pseudocontext can put kids into categories of 1, being able to make correct assumptions that help solve the problem, 2, making incorrect assumptions that lead to incorrectly solving the problem, or 3, not having enough experience with the context to even make entry points into the problem. Oftentimes, the use of these assumptions clouds the intended mathematical content. This isn’t helpful for anyone (assuming we actually care about the mathematical content in question). Finally, I know I recently read an academic article about how pseudocontext can lead to misconceptions, but I can’t for the life of me remember what article this was. This sound familiar to anyone? The trick is to get the student to see the problem as specifically not a real world problem. That way the student can enjoy the math part of it, without the confusion of the always nebulous real world. Mark, I agree, but then why even use the term bus. Why not instead talk about how many shmertzers you would need if you had 14 piffles and each shmertzer can hold 42 piffles. I would now argue that pseudocontext has been removed. I agree that the trick is to get students to see this as a non-real world problem, but this isn’t what the question was trying to assess (nevermind that it’s culturally biased). And as for enjoying the math part of it, why do I care about this shmertzer/piffle problem? Raymond: Here’s where my mind always goes in this discussion: every curriculum designer runs into mathematics that “resists” being presented in an authentic, meaningful context. In which case, I suggest we embrace the abstraction of it, recognizing that math, itself, is a context. Mr. H: I don’t see what’s so deadly about pseudocontext. It can provide examples to illustrate application of a mathematical principle. It creates conditions that are sanitized where simple mathematical models can work. I have a feeling we’re going to have a hell of a time over however long this feature runs trying to achieve some consensus on pseudocontext. The examples you cite, Sheng, aren’t pseudocontextual by my yardstick. They’re abstract, and in need of some kind of communicative visual, but the real world context isn’t flung haphazardly on top of some math in a hopeless effort to engage. Avery’s comment seems right-on. If you can replace the real-world units with “mystery number” or nonsense units and not lose any kind of interest or engagement you’re dealing with pseudocontext. The part where I struggle is with Mark’s implication that the escalator problem is pseudocontext. I don’t have any kind of grand defense yet. I’ll say a) it turns out to be rather hard to capture pseudocontext on photo or video, which is to say that video and photo go a long way to transform psuedocontext into context and b) I’ve never seen pseudocontext provoke students to cheers and high-fives. Suspension of disbelief (or maybe recognition and acceptance of pseudocontext), when working in authentic online environments, is discussed in this article by Herrington, Oliver and Reeve, and makes some interesting reading, especially in light of this conversation. Dan (via Jo Boaler) is right on that these kinds of problems (what our lead author calls “pretexts” instead of “contexts”) can lead to all sorts of issues. But “real” issues are often very messy, sometimes in ways that are debatable as to whether good mathematics is happening. 1. Work some “real” problems through completely, even if it means taking a long time to do it. The flagship problem for this in our books is the monthly payment on a car loan. In Algebra 1 students can estimate car payments and use Excel or other tools to check while learning about iteration and recursion. In Algebra 2 they can track payments as variables to build expressions for the total payment or the monthly payment. In Precalculus they use the formula for the sum of a geometric series to find the formula once and for all. This is a real context, done completely, and serves some other good mathematical purposes. 2. Use mathematics as a context. (Dan mentioned this specifically very recently.) Students can look for patterns in addition and multiplication tables to help them see why negative numbers behave the way they do. They can investigate what 2^0 and 2^(-1) might be defined as, and come to an understanding that there isn’t much choice in the matter. They can find functions that agree with input-output tables, by intuition, by common differences, by setting up systems of equations, by using matrices, by using historical methods (Lagrange Interpolation, Newton’s Difference Formula). None of this requires a pretext, and all of it feels as real to the students as any other context might. It probably feels more “real” than a lot of the contexts that appear in books, which students know are fake. 3. Acknowledge when pretexts are being used, and why. As “Mr. H” says above, we have good reasons for thinking about the parabolic path of an object, even though the real path isn’t parabolic due to resistance (and heck, even with no wind resistance, it’s actually elliptical). Sometimes a true context needs to be adjusted to be usable; I think it’s important for students to recognize or discuss when, and why, such adjustments are being made. When I first taught Algebra 1 this would be the part where we would tell kids to translate the sentence “into algebra”, and hope it works. What our book recommends is to guess at the answer and test it, NOT to guess-and-check for the answer, but to determine the process for checking any guess. This process becomes the equation. For example, say I guess 100 is the answer. How do I check? 100 plus its fourth… hm that’s 100 plus 25 that’s 125. Nope, it’s not 560, it’s not right. So I’ll guess again, maybe guess 8 this time. 8 plus its fourth… that’s 8 plus 2 that’s 10. Nope, it’s not 560. Eventually, tell kids to guess “n” and follow the same process. They will see through their numerical work that the second piece is n/4, and the equation is n + n/4 = 560. I hope this is described enough. Try it the next time you see a word problem, especially those goofball Mensa how-old-is-Billy problems. It’s slick, it actually works, it supports mathematical habits of mind, and it reduces the difficulty and “getting started” hurdles of algebra word problems significantly. This has gone on far too long, and I apologize! Best wishes to all teachers for the upcoming school year. It’s interesting that the escalator problem came up (pardon the pun), and kudos to Dan for making it fair game. On one hand, you could make the argument that it’s just as artificial as the “how old is William?” question. Just as you would ask William his age, you’d also just wait until Dan got off. Even though it takes place in the real-world, it’s not exactly a real-world problem insofar as it’s not a problem at all, but the outcome of someone’s *looking* for a problem. On the other hand, there’s exploration for exploration’s sake. And while “cheers and high-fives” might not be the best rationale (XBOX could make the same argument), maybe “Galileo” is…especially if the students are objectively better at something afterwards. Ultimately, Dan’s right on a larger point: there will never be any consensus on what “context” means, simply because math is multi-faceted. It’s a tool to solve real-world problems, yes, and also a more fundamental way of thinking about things that may or may not even exist. It’s chisel and ART at the same time. At the end of the day, though, I do wonder about the practical application of conversations like these. I’m as guilty as anyone at mulling over the esoteric intricacies of pedagogy, curriculum development, etc., but when all is said and done, I suspect the best road is the middle one. Strive for Socrates, but maybe don’t build an entire curriculum around it. In 1990, I interviewed to be admitted to Duke University for engineering. The man asked me Mr. H’s bird question from comment # 9, except it was a fly instead of a bird. I was floored. I was taking calculus at the time, and tried to apply this to the question, looking foolish. When the man told me how easy it was to solve with simple algebra, I wanted to strangle him. I didn’t get in. I haven’t seen that question in 20 years, but it still haunts me. Bowen: None of this requires a pretext, and all of it feels as real to the students as any other context might. It probably feels more “real” than a lot of the contexts that appear in books, which students know are fake. This seems right on to me. Thanks for not lying to kids. Bowen: A number plus its fourth equals 560. What is the number? Karim: On one hand, you could make the argument that it’s just as artificial as the “how old is William?” question. Just as you would ask William his age, you’d also just wait until Dan got off. I effed up a little in my critique of the age problem. It isn’t so much that its conclusion is thoroughly observable (which is true of the escalator, and is, in fact, a desirable outcome of WCYDWT) but that its premise is fake. My most confident definition of pseudocontext is this: “you can replace the unknown real-world quantities for ‘mystery number one’ and ‘mystery number two’ without sacrificing any engagement.” You can do that for the age problem, but not the escalator. Karim: Even though it takes place in the real-world, it’s not exactly a real-world problem insofar as it’s not a problem at all, but the outcome of someone’s *looking* for a problem. “A method in search of a problem.” Is that what we’re talking about with pseudocontext? Maybe. There’s a certain irony in forcing it, given that humans did invent math, after all, to understand observable phenomena. (Sure, it took on its own life at some point, but I’m referring to the “practical” side, which is what most of school math is). Instead of retroactively searching for context, perhaps an easier starting point is: “Why did we invent this [skill]? What problem did it allow us to solve?” You probably don’t see too many carpenters searching for authentic applications of their hammers. There’s enough out there to keep us occupied for years. Of course, I’m still at a total loss w.r.t. simplifying polynomials and, like Raymond, wonder whether some topics needs to be straight-up jettisoned. I’m curious: what percent of topics do teachers really take issue with? At the middle school level, I’d imagine it’s pretty low. Even in higher levels, though, I’d bet that there are only a handful of skills that are causing such angst. It’s sort of the 80/20 phenomenon in reverse: 20% of the content is giving us 80% of the headache. Pseudocontexts have long been a pet-peeve of mine. They are a hallmark of a particular grade-band in math. The beginning algebra student is the usual victim of a pseudocontext. While instructive of algebra, the problem is pendantic, overly concerned with the numbers and rules and not realistic in circumstance. Perhaps what is most annoying is the destructive shift away from ‘Central Ideas’ or ‘Big Ideas’, towards math as useless puzzle solver. I’d bet that puzzle solvers like the pseudocontext just fine. After consulting my “Ontario High School Arithmetic” (1909) I’ve found relatively few examples, perhaps since people didn’t have time for such nonsense 100 years ago – they wouldn’t put up with it! Inquiry based learning is the way to go, so that students wouldn’t be solving pseudocontext problems unless they chose to pursue an inquiry of puzzle solving. Now I have a hard time telling what is and isn’t a pseudocontext. Maybe it’s one of those “you know it if you see it” things. Just for reference here are the 3 problems used to introduce the approach I described earlier. a) Is Chiko’s number 12? b) Is Chiko’s number 8? 2) Diophantus’ childhood lasted one sixth of his life; he grew a beard after one twelfth more; one seventh later, he was married. Five years later, he had a son. The son lived exactly half as long as his father. Four years later, Diophantus died. How old was he? 3) Cameron tells about his trip to Big Books. “How awful! They want me to join their club to get 10% off. It costs $15 to join the club. It costs $8 more to buy my books if I join the club than if I don’t!” How much do Cameron’s books cost without joining the club? One thing I didn’t learn when teaching was that books employ a ton of special-purpose tools in use for solving word/context/pretext/situation problems. I taught kids how to solve rate problems using a box grid, and later how to solve paint-the-house problems using a different box grid. And they could do it, but three weeks later it was gone as if it had never happened, and no skill was retained. What I hope for is that students learn some general-purpose tools for solving problems, and generalizing from repeated calculation is one of the most useful. So in all of the above problems, we’d want students to guess at answers, not necessarily trying to guess the right answer (but if they do, hooray), but trying to create a generic guess-checker that can be used to build an equation. This skill can even be adopted when working with expressions — if Jim has j apples and Dan has 3 less, how many does Dan have? I beat my head against a wall with kids on this one with little long-term success until I recognized that they get it right when j is replaced by a number. So keep replacing j by numbers until kids can tell you the relationship: 10 makes 7, 5 makes 2, 100 makes 97, oh okay j makes j-3. Done. To me this works better than trying to memorize the vocabulary involved… and it can’t just be about the vocabulary, since there are a ton of kids who say that 7 is 3 less than 10 but then say that 3-j is 3 less than j. This error speaks to a serious issue, the disconnection between arithmetic and algebra. So, which of these four are pseudocontexts? I think they’re all reasonable math problems with a reason for their existence… which is more than I can say for a lot of the word problems I see in textbooks! Thanks again for the forum and conversation. I love this discussion as one of my favourite examples of a psuedocontextual problem is one where we are told “The Sydney Harbour Bridge has its platform with an area given by x^2 + 6x + 5……..” and then basically goes on to apply factoring in the actual question. However, I am concerned with the fact that it would be nearly impossible to come up with real contexts for everything we have to teach (based on our curriculum guidelines). Though some might argue that that, in fact, is the problem – all the needless stuff we need to teach. I agree with Mark who says that much of what we do in school is exercise for the brain and that is its real purpose. Most of the stuff we actually need to know for day to day life we learned in elementary school. Of course that is no reason to not try to give real and inquiry based problems when ever we can but I think it might not be realistic to do it all the time. Another thing is that sometimes the actual question may be non contextual but the set up could be. That is, we give a context where the math needed relates to the math being taught but may be too advanced. Someone mentioned the projectile motion problem and how to truly attack this problem you need to consider more than just gravity (that’s what the programmers for computer games with good physics engines or the modelers for CGI movies use) but we give students the “lite” problem so that the math is palatable. For example, I wrote a question dealing with the intersections of lines and planes in 3 space. The question itself was pretty standard and could have been asked on its own with no context. But the lead in was a blurb about a new technology that allowed researchers to study where autistic people were looking in given situations by using special glasses that could track the eye movements. Its really the same context but just under far more complex circumstances. I wish I could write questions like that everyday but there are only 24hrs in each day (for those of us who choose not to sleep). Also, I like Mr. K’s take on removing story problems from the real world. I haven’t read Liber Abaci (Leonardo Fibonacci, 1202) but for my money I bet it’s just the same. The rabbit problem is anyway, for sure. On the other hand, the problems from those old books have the advantage of being utterly awesome because they’re old. I would totally be excited to do a contrived problem from a book that was 1200 years old on the strength of it being 1200 years old, c’mon now! It helps if the problem is acknowledged as contrived. It almost ups its coolness because then it’s like “hey students, you know how you’ve been oppressed by contrived problems your whole schooling? Check out this 1200 year old book, you are about to do the MOTHER OF ALL CONTRIVED PROBLEMS!” I especially feel this way about the Fibonacci rabbit problem because THAT PROBLEM IS WHY IT’S CALLED THE FIBONACCI SEQUENCE. To contribute to Avery’s list of issues with pseudocontext (great word, thanks Ms. Boaler via Dan), or perhaps just to repeat what everybody has already been saying, but hopefully add a nuance (? ), it seems to me that the biggest danger in pseudocontext is this. If the story, as understood through the math you’re intended to do, runs in any way counter to students’ knowledge about the world, they are being trained to suspend their reasoning faculties while in math class. This is basically the craziest most harmful thing we could ever do to their mathematical development. The test for this (worst) kind of pseudocontext is: is it possible to get the wrong answer by reasoning sensibly about the context? Let me coin the term “evil pseudocontext” for this type of story problem. By this measure, Bowen, none of the problems you mentioned are anywhere near evil pseudocontext. On the other hand, Avery’s example about the buses absolutely is, unless the lower number of buses is also accepted as correct. Dan, you’ve been defining a broader meaning of pseudocontext (Let me coin the term “lame, depressing pseudocontext”) where the test is “could you sub the context out for meaningless doodads without the story losing any interest?” On this measure Bowen I think the Chiko and Diophantus problems might be a little pseudocontexty (though actually in the Diophantus problem somehow the story is adding something for me; I think it helps that Diophantus was actually historically like Mr. equation-with-an-integer-answer, somehow that causes there to be something wistful and emotionally compelling about an equation of his life; students doing this problem should get to know that about him), but this is made up for by the historical thing. In a way, the context in the problem is not even the real context (esp. if the teacher is up front about the contrivance). Really it’s a straight math problem being given vitality (if not scaffolding) by its historical context. The danger of this second kind of pseudocontext is about alienating students, teachers, and math from each other, as per your illustration Dan, since the problems and therefore the teachers are full of it. It’s insidious because it poisons the learning environment. But somehow it strikes me as not quite as bad (as evil pseudocontext), because at least it’s not directly debilitating to the students’ intellects. Here’s a reformulation of the test for lame, depressing pseudocontext. I think it is basically equivalent to Dan’s test. 1) Does anyone want to solve the problem? 2) If anyone does, do the people who want to solve it care about the story? If the answer to either question is “no” then this is a case of lame, depressing pseudocontext. What I’m going for with this reformulation is a shift that I feel like a lot of folks in the blogosphere (Dan, obv, and Riley, for example) have been jointly articulating, in how to understand the question of students finding math to be relevant / irrelevant. I feel like the emerging idea is that the question “how does this get used in ‘real life’?” is a red herring. As I remember Riley writing about though I can’t find it now, understanding compound interest is something that everybody can use in real life, but if when students say “this is boring and useless” you turn around and start teaching about compound interest but don’t change anything else, it’s not going to help. Conversely, it seems to me that actually polynomial factoring is totally useful in real life to a student in high school because you need it to pass your class. That life is a lot realer than the theoretical future in which you have a bank account and a credit card. The real test of whether a math problem is “relevant” is not “do you use this in ‘real life’,” whatever that means, but “do you want to solve it?” It’s not that you want to solve it because it’s relevant; wanting to solve it is what it means to be relevant. The solution to the problem of relevance cannot be aimed at any location in the process of education other than what the students want. We can access various natural processes in causing students to want to solve problems: they are naturally curious, hungry for understanding, they want to resolve cognitive dissonance when it comes up, they want to feel accomplished and mentally powerful, they’re drawn in by story, attracted to the perception of a grand scheme, to knowledge surrounding things they’re passionate about, etc. Curious is the big one. All these forces are amplified by a sense of comfort and orientedness in the face of a problem, and inhibited by any sense of helplessness or disorientation. So, this is my answer to David Petro and other folks concerned about how there are things in the curriculum not susceptible to being motivated by “real life examples.” This is fine. There was a reason why somebody made up these ideas. That means there were people who wanted these questions answered. That means there can be again. The challenge is to find the (strictly mathematical) drama / enticement to curiosity that is at play in the ideas, and figure out how to make it visible to students. If the ideas are really important enough to stress over how to teach them, then there should be plenty of drama and enticement available. What I’m ultimately getting at is that I think that basically the same principles are at play when you hook kids on a problem like the escalator problem or a pure-math problem, and I’m interested in all of us doing more thinking about how to carry the design principles we’ve found for each kind of pedagogy to the other. Okay I’ll shut up now. I don’t know what possessed me. Sue: David Eugene Smith’s two volume History of Mathematics is a very excellent book for exploring math history. It was written in 1923, so it’s been around for a while, and you can find used copies pretty cheap. Also the first half or so of Number: The Language of Science, about which Einstein said “Beyond doubt the most interesting book on the evolution of mathematics which has ever fallen into my hands” Bookstores actually still carry new copies of this book, but it is quite easy to find used copies as well. I, personally, find that knowledge of math history can inject context and interest about even the most contextless math. (Like, perhaps, factoring polynomials, or the difference between rational and irrational numbers.) Having a story attached makes it more real to many sorts of students. I tutor a younger student who likes to multiply by repeated doublings, and I like that I can tell him that he’s multiplying just like the Egyptian priests who figured out how to build the pyramids. It strikes me that the root problem is lying to students about the purpose of learning a given skill/technique/topic. Some mathematical topics DO have wonderful “real world” applications, and should be taught as such. Others are explorations into the realm of pure mathematics, and should be identified as such. We run into trouble whenever we try to sell math to our students for the wrong reasons (i.e. “imaginary numbers are useful for modeling in electrical engineering,” etc.). In my experience, being painfully honest about the reasons for studying a given topic or completing some mathematical maneuver has been met with appreciation and more engagement than I would have expected. Even if it means telling them now and then “we rationalize denominators because decades ago people had to look up roots in table form, and its easier to divide a nasty decimal than to divide BY a nasty decimal, and no one has bothered to break this trend.” I’d rather give an honest but slightly dismal answer to my students than to lie to them. My students generate a list of five reasons for doing math at the beginning of the semester, and I encourage them to ask me “why are we doing this” at any time. I can always relate it back to one of the five reasons, without overselling applications, for example. Yeah, that’s a beaut, Ben. I need to print that thing out and scribble all over it. … is the most heady stuff I’ve consumed today and that includes proseminar at Stanford, so it isn’t like I was sitting around watching reruns of Entourage. Something I’m realizing in all of this is that it doesn’t matter how I reply when a student asks “when will I ever use this in real life?” I’ve already lost. Because that student isn’t asking a question about an uncertain future; she’s lodging a complaint about a frustrating present. This is spot on. You don’t get that question when you’re teaching rational expressions with verve. You get that question when you’re tranquilizing with busy work. Appreciate & concur: psuedocontext, evil psuedocontext, & lameass psuedocontext stink. Relevant is what would be described retrospectively – because the learned wished to unravel the puzzle, solve the problem. So the question begging to be asked, especially if we are living in the curruculum writer’s house: what is a problem that has a true/ real / not psuedocontext? Can it be written prior to the child? I just blogged about a student of mine who, when I asked what math is, said, “It’s stuff you use every day. Like when you need to make change.” He’s 9, by the way, and probably isn’t going around making a whole lot of change. It made me furious that kids are (still) learning to treat pseudocontext as “important” and that actually important stuff has no business in school. Since reading this blog I have used it to make my classes better. When we do these problems in class, instead of leaving out the worst ones we pick them apart and have designed more realistic ones. You can ask your students what a question needs, why is it ridiculous. Great for algebra, as the need for more variables arises. Also if you connect with ToK in the IB programme these problems lead to interesting discussions. Wonderful! Sending this to my math-whiz son, his AP Algebra teacher, and the math profs here at the college where I work! My favorite part of the link was that, if you scroll down far enough in the comments, you see a discussion/argument about what the proper formula would be for finding the volume of a pizza with “radius z and thickness a”. You are a really brave person to venture into the comments in Failblog… :) Great find! I suppose it depends upon the context of when the question is raised and the attitude of the questioner. But, I find this to be a marvelous moment to take the students back to the big picture of why we teach what we teach. We often forget to share the following with our students…. Sometimes the topic is taught to open future doors (like an athlete that trains in the gym is building muscle, not for the sake of muscle building but to give them more strength for successful execution of their sport). Sometimes the topic is taught to enable future discussions (you cannot manage a forest without some knowledge of the individual types of trees). Sometimes the topic does have a “real world application” and they are simply curious if one exists (perhaps it was never mentioned). And sometimes the topic is taught simply for its beauty, or historical significance. And sometimes the topic is taught for many or all of the above reasons (or others I failed to mention). Often we forget to “contextualize” within their “big picture” why each element of the curriculum is selected. We obviously think it is worth their time to learn it. Even if they love it, love doing the work, love thinking about the problems, and get excited to come to our classes, it is a valid question (and one we should encourage) to ask your teachers “WHY”? I see this question not so much as a request by the student for a “real world application” but an opportunity to engage them in conversation about “why”. I won’t take exception to anything you wrote about the importance of circling students back to any number of our motivations for why we teach a concept. When a student asks me, “When are we ever going to use this in real life?” I’m certainly able to host that conversation. My point is that nine times out of ten, my student doesn’t care about the answer. The answer doesn’t do anything to mitigate her feeling of incompetence now. In our everyday lives we contextualize situations without realizing it. I need to be more aware of this in everything that I do. I thought about the term “culture dropping” in one of your comments and posted about it in terms of software development. I love all the comments and responses regarding pseudocontext. I agree with so much of what was said; however, the post about the need, or lack thereof, to rationalize denominators piqued my interest. It made me wonder: How many topics (that we currently teach) are outdated or perhaps unnecessary to bother with in K-12 mathematics? 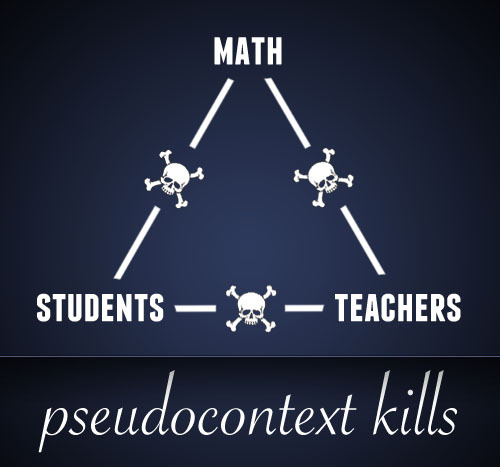 I know “pseudotopics” would not be a proper nomenclature, but I can’t help but think of all the time that is spent in high school mathematics classrooms on topics that have little contextual (pseudocontextual or not) application to the students’ future (in mathematics classes or life). It feels as though so many topics have been added, but none are ever purged. I have taught Algebra 2 every year for nine years and I have yet to completely address every learning standard in any of my classes. I often wonder if 1.) it’s possible, and 2.) a better way to organize the topics for high school mathematics in a more manageable and meaningful way, while still maintaining the integrity of mathematics (as a context in itself). What do people think? I get that certain topics (e.g., operations on rational expressions) are needed to simplify (say, a derivative being computed using the Quotient Rule) in higher-level mathematics; but is this something we should spend significant time on in high school courses? I am sure everyone reading this blog knows how much students love performing operations on rational expressions! And I totally agree that it helps to develop logical reasoning and is a context in itself, but there are so many other, and dare I say more interesting, mathematical topics for high school students that will still develop reasoning and critical thinking, while perhaps maintaining their interest. Examples: discrete mathematics or number theory. Or then again, I may be slightly hypocritical for suggesting more topics. The college algebra text we use at our community college is filled with bad applications. I was griping about it on my own little blog (with a link to a certain TED talk which led me here). The frustrating thing about our text is that it gives just enough lip service to the context to fall outside of the pseudocontext definition. Out of four parts of one question, three parts will be “plug this number into the formula” and one will require some thought of the situation. The book has just enough substance that I can’t convince the rest of the faculty to dump the book completely. I began writing textbooks in 2002 to address the very issues you raise here. I wanted to “get real” with students instead living in the mythical math world of widgets and whole number prices. My books feature real companies (e.g. Coca Cola, Johnson and Johnson) and real issues (e.g. AIDS deaths, homicides due to love triangles – the FBI tracks this!). My first books contained many real world contexts and some pseudocontexts. As I’ve evolved as an author, I’ve been working hard the root out the pseudocontexts from my own books and course materials. A guiding question I ask myself and my students is “why do we care?” If I’ve developed a good real world activity, we can answer the question effectively. If not, it’s back to the drawing board. My latest books, College Algebra: A Make It Real Approach and Precaluclus: A Make It Real Approach will be published later this year by Brooks/Cole, Cengage Learning. My coauthors and I have sought to avoid pseudocontexts in these books but we’re open to your feedback. If you find a psuedocontext, please let us know so we can replace it in the next edition. We share your desire to “get real” with mathematics. In 2006, I launched company named Make It Real Learning Company. The math learning activities I write for the company are focused on answering this question, “When am I ever going to use this?” The activities are currently being used by educators all around the world (from Africa to Asia, from the US to Europe). The website is http://www.makeitreallearning.com. Is there an official name for this method of teaching you are doing? I love the idea, and am trying to find some articles on it for a research paper. I haven’t read all of the comments, so I’m not sure if someone already discussed this or not. My school uses the CMP 2 curriculum, and for the most part, I really like it. It poses problems within the psuedo-contexts, and actually allows the students to explore the problems with some real world knowledge coming in to play. However, in one unit, there are questions about the “break-even point” – defined as when the income = expenses. The only problem is that in BOTH cases they give, the number is fractional (when you solve the equations), but the items being sold are not divisible! You can’t sell 133.3333… t-shirts!! That doesn’t make sense! If you round down to 133 shirts, you make a slight loss, and if you round up to 134 shirts, you make a slight profit. So the REAL answer is that with the numbers you chose, you can NEVER actually break even!